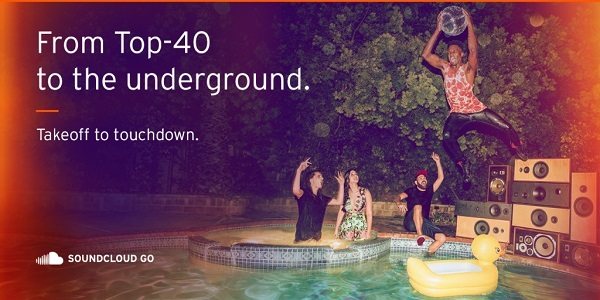 SoundCloud debuts subscription service SoundCloud Go. SoundCloud today announce that SoundCloud Go, its subscription service for listeners, is now available in the U.S. SoundCloud Go is the same SoundCloud you've known for years taken to the next level: with an expanded catalog of tracks that are new to the platform, new features and new functionality. Emerging artists, upstart indies and brand new artists - the same community that brought countless up-and-coming creators to the mainstream is still here. Now, on the heels of licensing agreements with UMG, Sony, Merlin, Warner and others, tons of additional tracks will also be available right alongside your favorite new artists and indies. With SoundCloud Go, the catalog now includes a slew of new tracks and albums from the biggest names in music. Want to take your tracks and playlists wherever you go? You can now make your likes and any of your playlists available for offline listening. Another offline option for serious listeners: SoundCloud Go enables you to make all of your current and future likes and playlists available for offline listening. Liked tracks and playlists will become available in real time. Any future tracks or playlists you like or create will automatically save as well. Ads help earn money for artists, but they can sometimes interrupt your listening experience. SoundCloud know that some users may want to remove anything that disrupts the experience of listening, whether that's an audio ad in-between tracks or a display ad. SoundCloud Go allows you to do just that: remove interruptive ads from your experience. With the launch of SoundCloud Go, creators can now reach more listeners in more places, and do so in the most diverse content ecosystem in audio streaming. In other words? Your tracks are in good company. With our algorithm-fueled discovery features, your best work could be queued up after a chart-topping hit - and your next biggest fan could be one click away. SoundCloud Go subscribers in the U.S. will also have the option to take your tracks offline - meaning they'll have access to your tracks and their plays will boost your stats regardless of whether or not they have a cell signal. You can Sign up for a free 30-day trial of SoundCloud Go here or through the latest version of the app. After the first 30 days, it's $9.99 per month (or $12.99 per month if purchased through our iOS app). You can cancel anytime. Finally, if you're a U.S.-based SoundCloud creator with a Pro Unlimited account, you'll have access to SoundCloud Go at a discounted rate of $4.99 per month for the first six months of subscription time.